For the love of Fish! Lemon juice – 2-3 tbsp. First prepare for the hung curd which is used in the second marinade. By using curd as it is, water tends to ooze out while grilling. For hung curd, pour the curd into a muslin cloth and tie it around the tap for the water to drip. Since it is only 2 heaps tbsp it would take less than half an hour for the process. Wash the fish thoroughly with water. You can use vinegar or lemon juice to remove some of the smell. Cut the fish into cubes, medium size. You can use bell peppers and onions as well cut into cubes. This is totally your choice. Marinate the fish with the first marinade by mixing all the ingredients in a bowl. Keep aside for 10 minutes. Mix all the ingredients of the second marinade in a bowl and transfer the fish in to this smooth mixture. Keep aside in the refrigerator for 15 -20 minutes. The marinade is enough for the fish. If you are using bell peppers and onions make more marinade by increasing the quantity. Put the fish on a skewer along with bell peppers and onion. Arrange them the way you like. Sprinkle some more pepper on top. Remember to soak the bamboo skewers in water for 20 minutes to prevent the skewer from getting burnt. Brush oil on the fish and also to the grate or grilling plate whatever you are using for grilling to prevent the fish from sticking. Preheat the oven at 450 F and grill it for 10 minutes; 5 minutes on each side since fish cooks faster. This may vary depending on your oven. Make sure the oven is really hot before grilling. This also prevents the fish from sticking to the grill. Do not move the fish after placing in the oven. Flip it only when it is thoroughly cooked on one side. This too prevents the fish from sticking. Serve hot with curd Mint chutney. 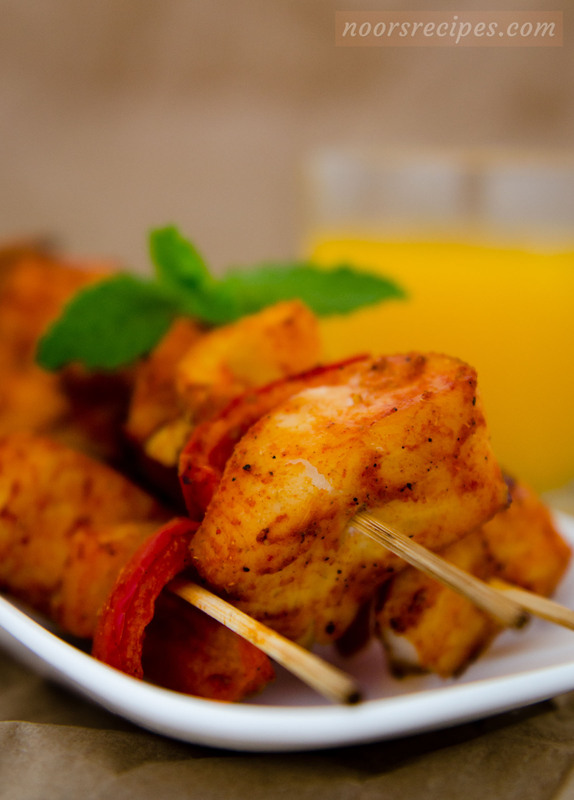 This entry was posted in Non-Vegetarian and tagged fish, fish dishes, fish dry, fish tikka, fishtarians. Bookmark the permalink.